As a therapist, when one runs into the same patterns couple-after-couple, year-after-year; general principles and rules evolve. This book offers both practical and actionable tools to help when problems arise. These tools have proven to help avoid emotional and physical disconnection. The book addresses problems such as poor communication, unmet or unreasonable expectations, feeling unheard, neglected, or resentful. If you are already in conflict, suggestions in the book can help you regain a balanced relationship. I am grateful for your support and interest in my book. Publication date is May 15, 2015. Pre-ordering on Amazon will be available in late April. 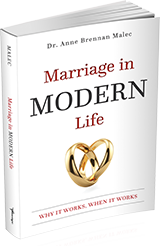 Thank you in advance to readers and website visitors who would like to receive updates about this book and future books, participate in couples surveys, or provide feedback about Marriage in Modern Life. To do so, please click on the Stay in Touch button.